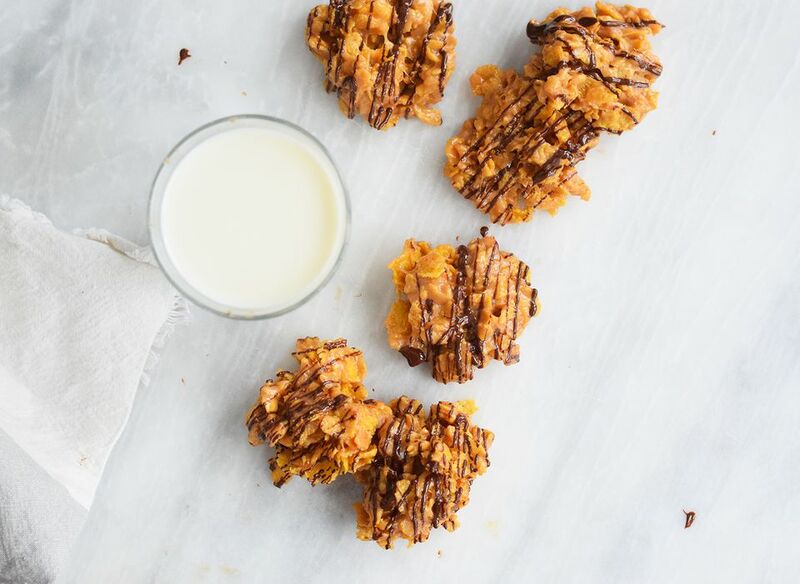 These peanut butter cornflake cookies could not be easier to make. They are full of peanut butter and chocolate flavor, and come together in less than ten minutes. Crunchy, chewy, salty, and sweet...they satisfy every craving. This is a great recipe to make with kids, who can easily form the balls (under supervision) and drizzle chocolate over the top. Add sprinkles for extra fun! Serve them with a cold glass of milk for an indulgent afternoon treat. You can also flatten the cookies when forming them, then turn them into ice cream sandwiches. Stuff some softened ice cream between two of the flattened cookies and freeze them on a wax paper-lined baking sheet until firm. Gather your ingredients. Place the cornflakes in a large bowl. Heat the corn syrup and sugar in a sauce pan. Gently stir the sugar mixture. Do not allow it to come to a boil. Cook the mixture until the granulated sugar dissolves, about 3 to 5 minutes. You can check to see if the sugar has dissolved by lifting a spatula out of the pan and seeing if you can still see the granules. There will be small bubbles that form throughout the mixture. Remove the pan from the heat. Whisk in the peanut butter and vanilla extract until completely combined and smooth. Pour the peanut butter mixture over the top of the cereal, and gently stir until the cornflakes are completely coated in the peanut butter mixture. Be careful not to completely crush the corn flakes. You can put half the cornflakes in the bowl and mix in half of the peanut butter mixture, then top it with the remainder of the cornflakes and peanut butter mixture. Using two spoons, scoop dollops of the batter onto a parchment-lined baking sheet. Melt the chocolate in the microwave in thirty-second increments until smooth and completely melted. Drizzle the melted chocolate over the top of the cornflake balls. Allow cookies cool for thirty minutes or until completely hardened. Serve or store in an airtight container. There are so many possibilities with these cookies! Mix in 1/4 cup of melted chocolate or Nutella into the peanut butter mixture. Use different cereals, like Rice Krispies. Mix in mini marshmallows with the cereal before coating them in the peanut butter mixture.